Drilling on the high-amplitude magnetic target, referred to as the “Doppler” anomaly, has intersected intense magnetite-biotite altered mafic and porphyritic intermediate volcanic rock types explaining the source to this regional anomaly. 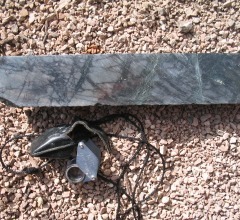 Based on visual analysis, no significant copper mineralisation was encountered however several widely spaced, 1-3 metre thick, shears and vein zones with weak copper sulphides are observed over the length of the hole. Importantly, the porphyritic volcanic rock type and intense magnetite-biotite alteration intersected in the Doppler hole (DO-17-01) appears similar to that described in the halo surrounding the large Ernest Henry deposit. Future work will be directed towards finding zones of structural brecciation and increased copper mineralisation within this interpreted alteration halo. Selective intervals of the core are being cut and assayed for copper, gold and a variety of trace elements to help guide any future step-out drill holes.